The Spirit of Greed meeting Yoshi. 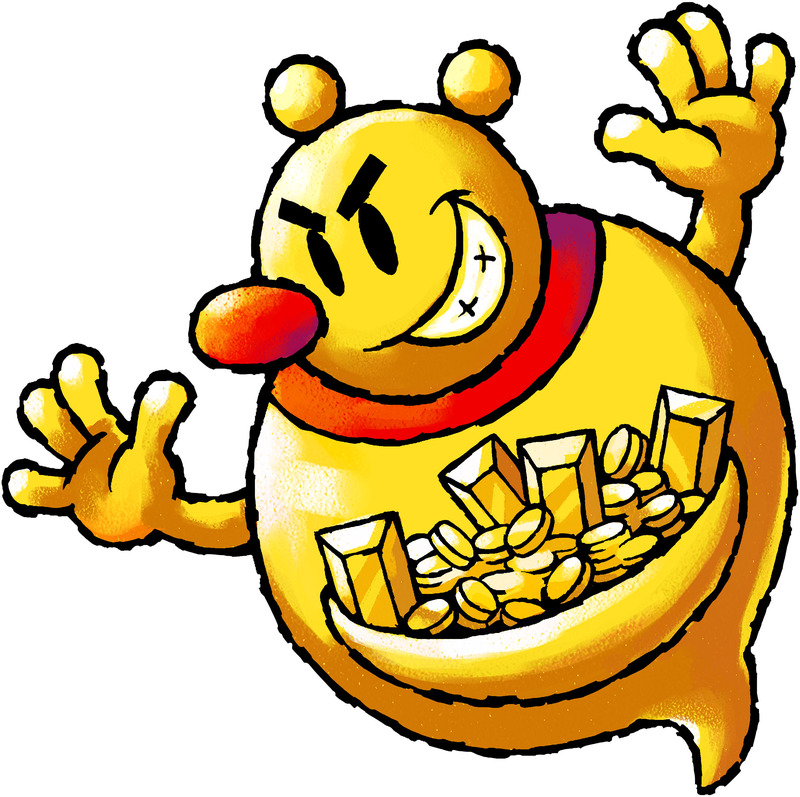 The Spirit of Greed, also known as the Spirit of Money, is one of the Yoshi Island Spirits seen within the Forbidden Pop-Up Book in the Game Boy Advance game Yoshi Topsy-Turvy. He is a very greedy spirit who loves the riches and all things gold (he even has a golden shadow). He judges people on how much money they have, and even asks Yoshi how rich he is when they first meet. This spirit is found on the second page of the Forbidden Pop-Up Book, but he is not very keen on letting Yoshi pass to the third page. He demands Yoshi to collect a large, but certain amount of Coins within four different levels of the page. A Happiness Medal will be awarded to Yoshi if he satisfies the spirit. Collecting an amount near the set target will award Yoshi with a Silver Medal, while collecting an amount much above the target will award a Gold Medal. The Spirit of Greed also appears in other pages of the Forbidden Pop-Up Book, where he and another spirit assign the Coin task to Yoshi in order to increase the difficulty of a stage. The Spirit of Greed appears to be a large, golden creature with a face resembling that of Tap-Tap the Red Nose and a red garment. He has four-fingered hands and a pouch which holds the many coins and gold bars he has. This page was last edited on November 28, 2018, at 18:27.